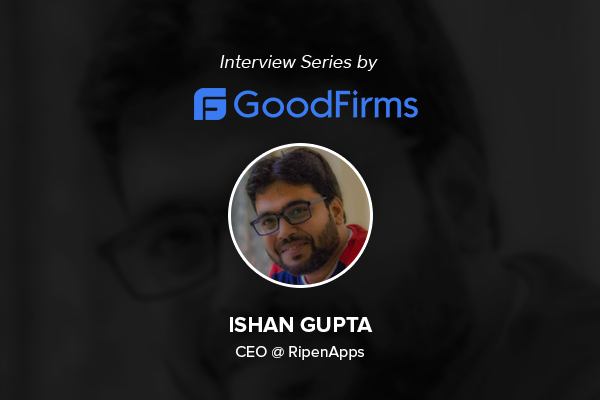 Mr. Ishan commences by introducing his company, RipenApps and his role of CEO in the firm. Being a team comprised of innovative minds and experts obsessed with technology, he says, they utilize the team’s skills and experience at the best to develop their business processes and make it smoother. It was founded in India with a vision of providing ease to businesses on the technological front so that businesses can focus more on their core management. Today, the company even provides services from its offices in Germany, United States, and Dubai. Describing his role, Mr. Gupta says that he has been more inclined towards product analysis and here, at the firm also he looks upon the production quality part adhering to the maxim adopted by the firm “Quality alongside Quantity”. He adds that he enjoys sharing insights with his clients on how to improve their business models through the services they are availing from Ripenapps and in turn benefit their return of investment. Mr. Gupta shares the objective behind starting the firm. He says that they wanted to put a mark in the sector by creating useful apps. And, hence they now focus on creating apps that are specifically focussing upon niche subjects and they try to bring in their innovativeness in each app they create. They not only give their best in developing apps within the pre-decided timeframe but their microanalysis is also very impressive. They look upon each feature of the app before deciding the timeframe and then commit for the same. All such amazing services lead the firm among the top app development companies at GoodFirms globally. Why not, they not only speak of creating an exception, but they also work accordingly that each client perceives the same and feels exultant choosing them. In the interview, CEO Mr. Ishn also talks about their billing process and their business models. He even gives insights upon how to choose the apt platform for creating apps and on multiple platforms. Having expertise in creating native and hybrid apps on platforms like Native and Reach JS, they aim to revolutionize the digital world. Talking about other services, he adds that their firm even offers web services. Both the mobile app and web development services they provide are end-to-end. Mr. Ishan takes proud that they have an amazing in-house team of developers capable of handling humongous projects at a time that they do not need to outsource their projects. They believe that that increases their productivity and they are able to create amazingly creative websites too. Among the worldwide renowned web development companies too at the platform of GoodFirms, hence RipenApps makes a position among the top. The most interesting part of the interview was when he shared his insights on how to choose the right platform for the services to avail like Android or iOS or cross-platform. He even added his insights upon the key parameters to be looked upon while selecting the platform and many such other things. The way he presented his business model for the company gains the most attention. Reviewing GoodFirms for their services, he seemed quite impressed. To more on what he writes there, have a quick read of the full Interview with GoodFirms of the charismatic personality. Washington, D.C. based GoodFirms is a maverick B2B research and reviews firm that aligns its efforts in finding the top web development and mobile app development companies delivering unparalleled services to its clients. GoodFirms’ extensive research process ranks the companies, boosts their online reputation and helps service seekers pick the right technology partner that meets their business needs.